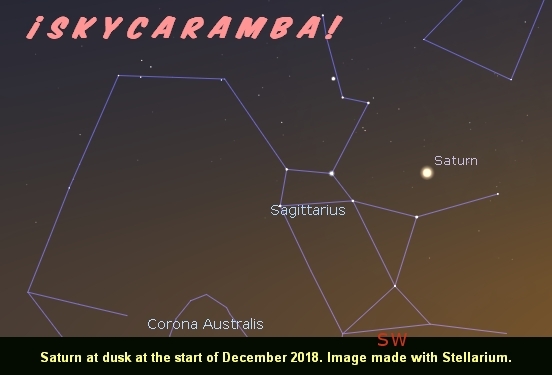 Saturn remains near the Sagittarius teapot after sunset when December starts. The ringed planet will set not long after the sun. 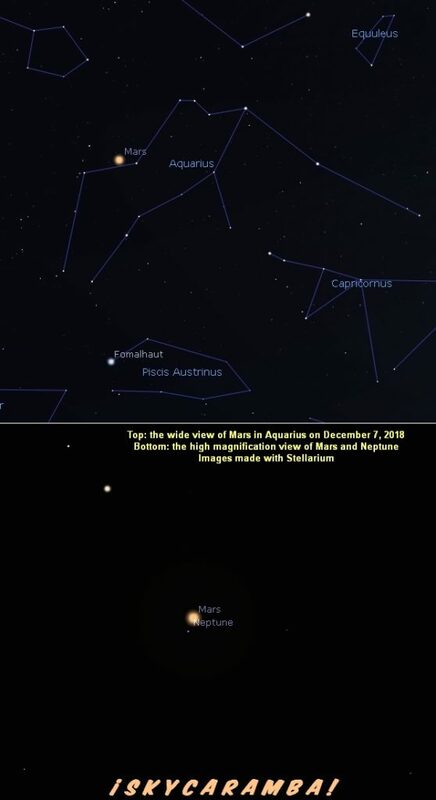 Mars is close to the meridian, in Aquarius, ready to set around midnight. A waning crescent moon rises a while after midnight. Venus is in Virgo closer to dawn. Mercury is a hard catch even closer to sunrise. Mercury is higher in the sky each morning until 15 days into December when it’s at greatest elongation 21.3° degrees from the sun. You should notice Jupiter rising below it before then. And then, Venus is clearly heading out of Virgo toward Libra while Mercury is heading sunward again and also toward Jupiter. Mercury and Jupiter will be close on the 21st. By the 25th, Venus is in the diamond of Libra. At the end of the month, Venus, Jupiter, and Mercury make a fine sight for morning sky watchers looking east. Meanwhile, back to our evening sky. Saturn stays just about where it is in Sagittarius all month. It’s setting very soon after the sun by the end of December. Don’t be surprised if you can’t find it as the new year approaches. Mars goes east and passes by a star named Hydor on the 4th. Then the red planet passes slowly below the western (or southern) head of Pisces for the rest of the month. This month’s moon phases are: new on the 7th, first quarter on the 15th, full on the 22nd, and last quarter on the 29th. The moon crosses the equator going south on the 2nd, is farthest south on the 9th, goes north again on the 16th, is farthest north on the 23rd, and goes south across the equator again on the 29th. Lunar apogee this month is on the 12th. Perigee is on the 24th. Distances are 405,300 km (251,800 miles) and 361,000 km (224,300 miles) respectively. Earth is at its southern solstice on the 21st at 22:23 UT. Venus is at perihelion on the 26th. Its distance from the sun is 0.718 astronomical units. Some notable conjunctions this month: the moon 7l.2° north of Spica on the 3rd, Venus 3.4° south of the moon on the 3rd, Mercury 1.8° south of the moon on the 5th, Jupiter 3.4° south of the moon on the 6th, Neptune less than 0.1° south of Mars on the 7th, Saturn 1.1° south of the moon on the 9th, Mars 3.4° north of the moon on the 15th, the moon 1.6° north of Aldebaran on the 21st, Mercury 0.8° north of Jupiter on the 21st. 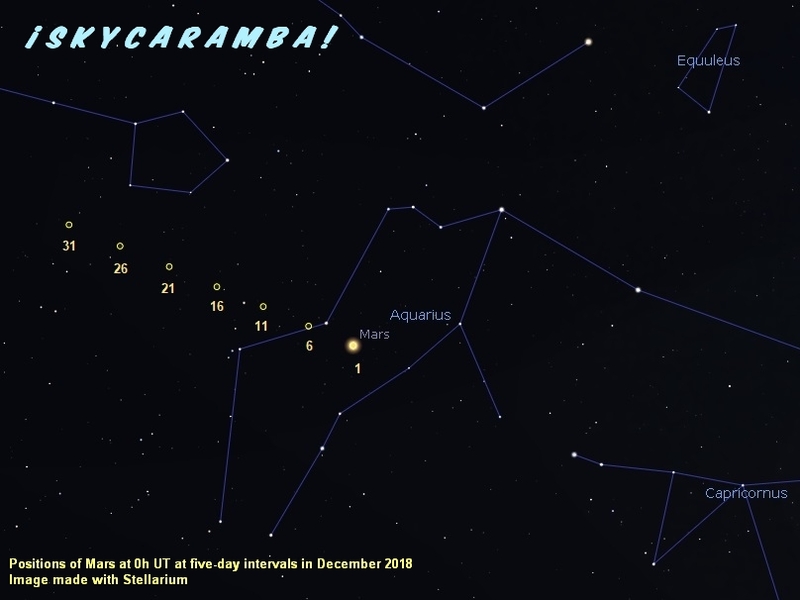 The Geminids meteor shower peaks on the 14th. Look for meteors of many colors, especially after midnight when the nearly first quarter moon has set.